Dual prompts for version Upgrade! Please refer to the following URL & help clarify the 'Logic' behind these dual prompts for Version-Upgrade ? Plain relaunch would have been sufficient then why this Duplicate prompt is showing up (denoted by Number 2) ?? Rest of the Chromium-based browsers never show up such Duplication & thus do not create Confusion for the end users..! There are other ways to get there - in particular, if an update is downloaded the restart option will be on the menu. Hence the dialog in case you accidentally hit the wrong item in the menu. I agree, it is redundant when reached from About Opera. I don't remember have seen that dialog asking about update installation before. Hon. members are requested to heed to this reported instance & inform the Developer-Team on this. The reported issue is very much persistent in nature & turns up every single time during the Browser-Upgrade process. 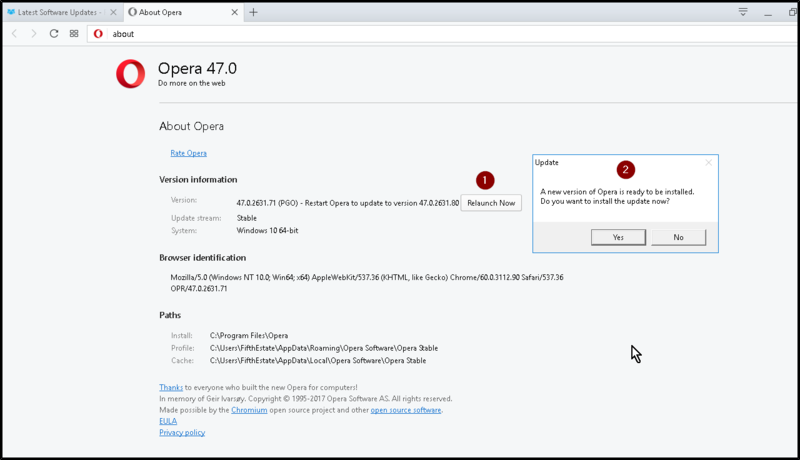 Some of us let Opera update itself, in which case there is no prompt at all.